Clinical and technical experts define critical use cases for information sharing. Technical experts create detailed specifications for communication among systems to address these use cases, selecting and optimizing established standards. Industry implements these specifications called IHE Profiles in HIT systems. IHE tests vendors’ systems at carefully planned and supervised events called Connectathons. IHE also organizes demonstrations of IHE-compliant systems working in real-world clinical scenarios at medical meetings and other venues. IHE Profiles provide a standards-based framework for sharing information within care sites and across networks. They address critical interoperability issues related to information access for care providers and patients, clinical workflow, security, administration and information infrastructure. 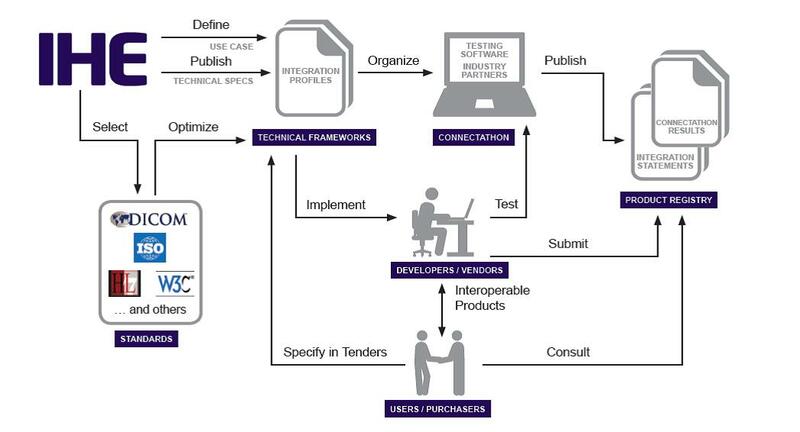 Each profile defines the actors, transactions and information content required to address the clinical use case by referencing appropriate standards. See capsule descriptions of current IHE profiles in each domain. IHE Profiles are compiled into IHE Technical Frameworks-detailed technical documents that serve as implementation guides and Technical Frameworks freely available online. IHE has been testing the interoperability of HIT systems for more than a decade. At IHE Connectathons held regularly in several locations internationally, trained technical experts supervise testing of vendor systems, making use of advanced testing software developed by IHE and several partner organizations. More than 250 vendors worldwide have implemented and tested products with IHE capabilities. For more information contact testing@ihe.net. The IHE Product Registry provides essential information for IT administrators and executives responsible for purchasing and integrating systems at healthcare sites and health information exchanges. Detailed results of testing at IHE Connectathons over the past several years in Europe, North America and Asia are made available in this easy-to-use online database. These results are cross-linked to IHE Integration Statements- conformance commitments of the IHE capabilities of commercial products-from dozens of vendors worldwide. IHE also provides domain-specific guidance for purchasers and implementers of HIT systems in the form of IHE handbooks and white papers. Carefully implemented interoperability standards are the foundation of EHRs, PHRs (personal health records) and health information exchanges being established around the world. IHE has developed a foundational set of profiles for secure exchange of patient information across enterprises. IHE profiles support health information networks in Canada and the U.S.A, as well as several Asian and European countries, and have been accepted as requirements by the U.S. Secretary of Health and Human Services for federal procurement of healthcare IT systems.